Last March, we decided to adopt a shelter dog. After weeks of searching PetFinder and Craigslist, my youngest found him. "That's the one." No matter that this dog was in a rural shelter two hours from home. He was destined to be ours and we made the trip. Walking across the damp floors of the shelter, we searched the cages for our dog. Most dogs pawed frantically at the gates of their kennel. Every dog barked and the barks echoed through the concrete tunnel of the shelter. We finally found our dog - of course, in the last kennel. Out in the yard, we fell in love and took him home. Only, after several weeks, we realized that this dog was not actually "our" dog. He wanted to eat our cat too much to be part of our family. We worked with behaviorists but no luck. Ultimately, we found him a wonderful new cat-free home. With all the time that had passed, it was too late to get a dog. We'd be leaving on a trip in a month. But I couldn't forget those barking dogs, that wet floor, the echoes in the concrete. In late April, I began advertising on Craigslist for the shelter - anonymously, because I was embarrassed. After a month, the shelter director tracked me down through an ad to let me know that my ads had dramatically increased adoptions and to beg me not to stop. My heart swelled with pride, happiness and something more. I kept up my ads and one day, one of the adopted dogs popped back up on the shelter website with a note - "please help her, she has had puppies." Fortuitously, a Facebook friend fostered puppies for a local rescue. We put our heads together and Freckles and her puppies were out of the shelter and in a foster home in no time. Two weeks later, I met Freckles and her puppies while they were staying for a week at my friend's home. As I sank my hands into her soft fur, I swallowed a lump in my throat. I felt alive. I felt satisfaction. I felt centered. Freckles pups being well socialized. As I understand it, they've all already been adopted. Me meeting Freckles at my friend's home. I've only met a couple of the dogs I've worked for. 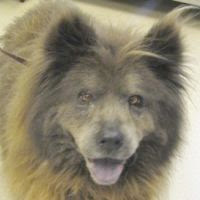 Last week, my shoulders sagged when I went to renew my ad for Indigo, a 12 year old Chow mix, who lived her whole life with the same family but lost that family when they lost their home due to foreclosure. I'd written the most creative ads for Indigo that I could think of. I was at a loss. I let my fingers and social media do the walking. I looked up Chow Chows on Facebook and posted about Indigo, two other Chows and a Chow mix mama who had just had babies - all in my shelter. Within a week, Indigo was out and in a loving foster home. The mother and babies were rescued and the other two Chows - Oprah and Stedman - are awaiting transport to their foster home. I continue to place my ads. Since then, a rural rescue that works with "my shelter" has asked for ideas promoting their dogs. Since then, I gave all the food and medicine from the dog we could not keep to a local family who lost their home and is struggling to keep their pets. Since then, I've helped a rescue organization try to reform a high kill shelters by promoting their cause online, advertising their foster dogs and contacting the press. Since then, many more animals have found homes because of me. Since then, I've felt warm inside. I've felt my heart squeeze. I've felt hope and much more. Since then, I have made a difference. I could easily stop placing my ads. Stop networking with friends and rescues. Worry only about my own family. But you know what happens when good people do nothing? They stop feeling so good. Cubby spent six long months in the shelter and was adopted one month ago. I received an email from the adoption coordinator thanking me as the adopters came in response to one of my ads. I never met Cubby but was told that the volunteers cried with joy when his new family took him home. 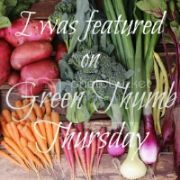 *The original version of this post was published on my personal blog, Green Bean Chronicles, last month. * This post is the Green Phone Booth's entry for the October "Green Pet" edition of the Green Moms Carnival. Read what green moms have to say about eco-pets on October 12th at Condo Blues. The Green Phone Booth welcomes back Betsy of Eco-novice. My Sony Vaio laptop is 6 years old. Do you think that’s old for a computer? My husband (an electrical engineer savvy in all things computer-related) thinks it is very, very old. So old, in fact, that when I complained about needing a new laptop battery (since the original battery now lasts 0.5 seconds), he suggested I get a new laptop instead. He told me the new Sony battery would cost around $200, but that a new laptop would cost maybe $600. My husband said he didn’t want to spend $200 on a new battery when my laptop might die any second. 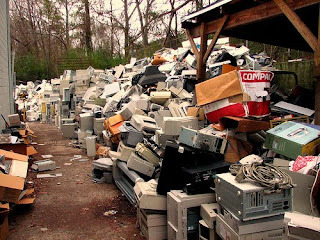 When this conversation first occurred (it replayed itself periodically for the next many months), I had just written a post about electronics waste, and I just couldn’t bring myself to dump and replace my still functioning laptop. But I did find not having a functioning battery very annoying. I have small children so we have to hide cords behind large pieces of cardboard under our desks, and even simply moving the power source was a hassle (not to mention that I had to turn on and off my laptop to move it). And, yes, I tried an external battery, but if I jiggled it even slightly it disconnected and my laptop immediately turned off, so it wasn’t any better than the original power source really. My laptop had basically become a desktop. But, don’t worry, this story has a happy ending. Many months later, my husband informed me he had found a knock-off battery on Amazon. This battery cost $60, which my husband was OK with spending on my nearly-obsolete, one-foot-in-the-grave laptop. I figured that replacing the battery was so far superior to replacing my entire computer that I immediately bought it. We’ve been happily chugging along ever since. But what if my laptop (or other electronic device) really does bite the dust? What then? First, I will find a responsible place to recycle my dead laptop or other electronic device. You can find a list of responsible electronics recyclers near you here. At least once a month I get a flyer for free electronics and/or metal hauling left on my doorstep. That seems like a convenient option, but my sister, who used to work for Goodwill (which does recycle computers responsibly), tipped me off that many of these places turn around and sell your electronic refuse overseas, where it is handled in an extremely hazardous manner to both the persons disassembling it, and to the local and global environments. For more information on responsibly recycling your obsolete or dead electronic devices, check out this Guide to Recycling Your Electronics. Second, I will consult resources for identifying “greener electronics” before making my purchase. I will also consider purchasing a refurbished device. My sister had a good experience buying a refurbished flat screen and desktop from Goodwill. Whether you need to replace your electronics or not, consider taking action to promote responsible recycling of electronics. How do you decide when it’s time to replace an electronic device? Lawn care can be a pretty toxic chore. With pesticides, herbicides, gas fumes, large amounts of water, and more. Thankfully there are many ways to make lawn care greener. A couple of years ago we got a WORX electric lawn mower. It's great and my husband loves that I can now mow. Before the gas fumes were to much for my asthma but since it's electric, it has no fumes. All of our other lawn care items are WORX electric as well. Chemicals are another part of taking care of a yard that can be bad for your health and the health of the environment. Studies have linked Roundup to birth defects, which only adds to the worries of using chemicals on your yard. So what can you use that is safe? For weeds white vinegar is great! Now it will kill grass as well so it's best for on sidewalks and places you want to kill everything. You can get the big gallon size bottles of vinegar and put them in a pump sprayer and spray it where needed. 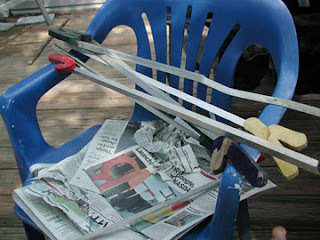 For gardens lay down cardboard or layers of newspaper around the plants and cover with mulch to keep down the weeds without chemicals. For bugs, EcoSmart is a fairly good brand and most Home Depots and Lowes carry it, making it easy to find. Borax is another option but I'm not a fan of using it outside as it's toxic if ingested by people or animals. Soapy water will kill some bugs and garlic is great for keep bugs away from your garden. I also found garlic powder on my plants kept the rabbits from eating my plants. There are a ton of other great natural options, click here for some of them. Many parts of the country are currently in a drought and having watering bans. While conserving water is always important, times like this are even more so. Rain barrels are one way to save water. I not only collect rain water in mine, but I also dump my grey water in it. Also be sure to water early in the morning or late in the evening when it's cooler and less water will just evaporate. When planting new plants choose plants that handle your climate well and are drought tolerant. Using tips like these can help you to have a healthier yard for you and the planet. Please be sure to share any of your tips with us as well! Happy Really Late Birthday and Earthday! I’m writing this Saturday afternoon, having just survived a fairly small birthday party of 6 year old girls. There were only 6 in total, including the birthday girl, and it’s the first such party where we’ve actually had more activities planned than there was time to accomplish them all. It was a good party, actually, I’m fairly proud. We did an “Earth Day Birthday” theme, which I know is very very late on both counts—my daughter’s birthday was actually in May, and Earth Day itself is of course April. But it had the bonus of being a beautiful summer day where we could spend the entire time outdoors. We set up table and chairs in the backyard, doubling as craft table and mealtime table. I’d baked an “Earth Cake” using the same recipes for cake and icing I’ve used in the past, did a fairly clumsy job decorating it (as you can see from the photo! ), but I’m not that kind of artist, you know? We did the chalk art thing out front until all the girls arrived, which made it easy for everyone to find the house, since it was the house with a bunch of kids out front drawing on the driveway in chalk. 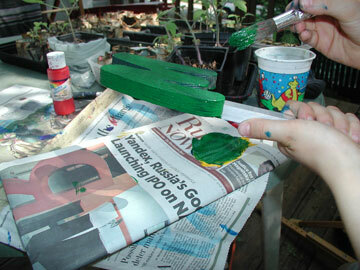 Then we went into the backyard and painted terra cotta flowerpots I’d gotten for $1.50 at Hobby Lobby. A bunch of paintbrushes and sponges of different sizes and a bunch of acrylic paints, and old oversized white t-shirts over clothes, and they had a ball—did some very pretty and creative work, too! Then we made pinecone bird feeders—we spread a little sunflower butter into some pine cones we’d gathered at the park last week, and rolled them in birdseed, with pipe cleaner hangers…we’d planned to string cheerio type cereal onto the pipe cleaners but discovered when I got the box of cereal home that I’d messed up and gotten one that was sugar-glazed, which I didn’t want to use for birds. Note to anyone who tries this—refrigerate the nut butter first (we got sunflower because I didn’t know if we’d have any nut allergies), it’s very drippy. And we did refrigerate it afterwards, and wrapped each one in a little cling wrap (I know, plastic disposable, but there was really very little trash generated at this party! ), and sent it home with each girl. Then we opened presents, and honestly by then it was almost time to go home. We had also planned for squirt-toy play outdoors, but they weren’t really interested in that, so instead we left well enough alone for the last ten minutes, let the girls play with the new toys, and I potted the little marigolds we’d bought in the pots they’d painted, instead of having them pot them as planned. (That’s my one real disappointment, that we didn’t get to actually do the flower planting.) We’d also planned on decorating these very simple canvas bags ($3.50 for 4 at Hobby Lobby) with fabric markers, but had run out of time for that too…so everyone went home with a fairly simple reusable bag with a little gardening shovel ($.33 at Hobby Lobby, midsummer sale on gardening stuff, I guess!) and a pair of gardening gloves, a pine cone bird feeder, and a living flower in a pot they had painted. I think everyone had fun. I even actually had fun. And my daughter was in seventh heaven, which is what matters. Going Green Mama is off to do some party shopping! I never thought I'd do party shopping at the farmer's market, but I like the way it feels. Last night, I made my grocery list for my daughter's birthday party, which we're co-hosting with a neighbor. And I realized, particularly with side dishes, most of what I could buy could come as far away as the next town over. My pasta salad? Grabbing a few basil plants and zucchini at the market, and spinach from the back yard. Fresh cut veggies? No problem. Watermelons? We're still a few weeks away from local melons. But it beats giving up my home-grown strawberries! 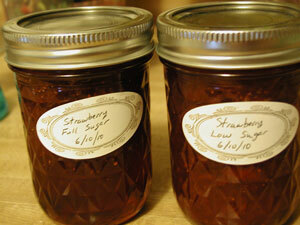 What are you cooking up from the local markets lately? Any plans for next weekend's cookouts? Post your comments or links below! Is our attention to detail impeding our green progress? I recently went online to order a $20 item. In order to get free shipping, I needed to add another $5 to my order. I had been wanting some more reusable grocery bags as some of mine are wearing out beyond repair. This was the perfect excuse to get a couple of bags. I wanted something sturdy, and I wanted to choose the greenest option. I looked at canvas bags. I read dozens of reviews and worried over reports that the bags would shrink after washing them. I looked at bags made from recycled drink bottles. I compared sizes. I compared strap length. I compared prices. I looked at dozens of options. I called my sister to ask her opinion — what is most practical? What is the greener option? Two hours later — seriously, it may have been even longer — I decided on the perfect bags. I added them to my cart. They were not eligible for free shipping. I wasted hours trying to be frugal, practical and eco-conscious. I run into this all the time. Should I buy the glass jar of peanut butter even though it is huge and we’ll never eat that much? Or is it okay to buy the smaller, cheaper plastic container of peanut butter? I dutifully bought expensive cage-free, organic eggs for months — and then I started reading that “cage-free” doesn’t really mean what you think it means. And then I saw a list that reported my egg producer of choice was not one of the good guys. (Anyone know where that list is? The link circulated on Facebook a while back but now I can’t find it.) Today, I stare at the egg cartons in distress during every shopping trip, not wanting to pay extra money to a company that is scamming me with its “cage-free” label but not sure what my best option is. The list of agonizing decisions goes on and on. Buying a water bottle is a week-long research process. I’m not sure I’ll maintain my sanity if I ever have to buy another car. My decision-making process is inefficient. In part, it is just a personality flaw of mine. I research things to death. In part, I’m still learning how to evaluate what is most important. Like my canvas bags: is it more important to choose a bag that prevents waste from hitting the landfill or to find a bag that is biodegradable? Did you know there is research about how we make decisions? It is really quite fascinating. Don't Overthink It: 5 Tips for Daily Decision-Making over at 99% sums up some of the research. Apparently I’m a “maximizer,” not a “satisficer.” Even though I spend far more time and energy making a decision than a satisficer, I’m less likely to be satisfied with my choice. I need to transform into someone who can identify the most important criteria and then go with the first option that meets those criteria. That peanut butter that I buy once a year? Is it really that big a deal? I buy it when I’m camping so glass probably isn’t the best bet even though I am trying to cut down plastic consumption. Those eggs that I buy at least twice a month — that is a bigger deal because I do buy buy them more frequently and should try harder to support good farms. Instead of agonizing over canvas bags for hours on end, I should be researching weatherstripping or other home improvement projects that can make an ongoing difference in my footprint. Do you find that you get so bogged down in details that you don’t make progress or get frustrated? How do you make the most of the time you invest into making green decisions? Last Monday, my husband arrived home from work and headed into the kitchen to grab his dinner, but he was distracted by a gloopy white puddle that was taking over one end of the table. He bent down to get a closer look. "What is...Is that glue?" I replied, "Today was not our best day." Luckily, my summer began with the arrival of a new book about nature exploration: It's a Jungle Out There! 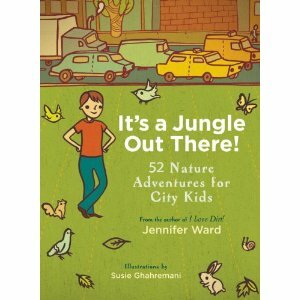 : 52 Nature Adventures for City Kids by Jennifer Ward. We are now well-equipped with ideas for spending time outside (since I typically counter the complaint "I'm bored" with the command to "Go outside!"). Jennifer Ward, the author of I Love Dirt! and Let's Go Outside!, spent most of her life surrounded by nature. When she moved to a city, at first she felt starved for nature, but then she realized that the natural world was still thriving all around her if she took the time to look for it. Her experience led her to write her latest book, It's a Jungle Out There! : 52 Nature Adventures for City Kids. I've written a couple times about my own attempts to introduce my city kids to the natural world, so y'all know this book is perfect for me. Most of the ideas are pretty simple and common-sense, but it's nice to have a compact reminder of many of the fun things kids can do to explore nature in an urban setting. I also really liked that this book is organized by season, and the 52 activities could easily translate into once a week planned nature outings. And now for a giveaway! I've jotted down a few ideas from It's a Jungle Out There! and am now ready to pass it and my copy of The Green Hour along to another reader. If you would like to win this book bundle, simply leave a comment telling one thing you like to do outdoors (along with a way to contact you if you win). I will randomly select one lucky commenter and will reveal the winner next week. The winner is Carol N Wong who commented, "I love to go to a park and hike and even better go on a guided tour through a park." I don't know about where you live but around here it's already very hot. We have had a few 100+ days already and so spending time outside is not always an option. One thing I enjoy doing on hot days is viewing environmental documentaries, so I thought I would share some of my favorites. Earth- (Rated G) This is a beautiful documentary from Disneynature is great for the whole family. Oceans- (Rated G) This is the second Earth Day documentary from Disneynature. GasLand- (Not Rated) This is a very interesting documentary about natural-gas drilling. Flow: For Love of Water- (Not Rated) Learn about all the issues surrounding the water crisis. Blue Vinyl- (Not Rated) A funny but informative look at the vinyl industry. Food Inc- (Rated PG) A powerful film about the food industry. The Future of Food- (Not Rated) Another great film about the food industry. Some I haven't seen but are on my to-watch list. What documentaries have you enjoyed and which are on your to-watch list? I can't help comparing this in my mind to the very earnest and passionate hand-wringing howling into the darkness a lot of us bloggers do (by which I mean me, no reflection on my wonderful colleagues and fellow bloggers)...sometimes I wonder if anyone but other like-minded blogger-types are even listening and hearing. But this video was made by teenagers. High school students. Who've crafted a little mini-movie in the language of teens to make a very simple and straightforward point and deliver a clear message: guys, we have new toilets that will save water, because it's kind of important, and here's how you use them, it's incredibly easy, and check out the funny zombies. So simple. But so effective. I spend a lot of sleepless nights and early mornings wondering what kind of world I will leave to my children. And then, when I see things like this, I begin to wonder if they, not we, are the ones who will create a better one. Going Green Mama is ready to make another batch of peach cobbler! There's something about traveling that makes home life seem, well, homey. Like the time I went to Pike Place Market in Seattle, only to nearly cry upon seeing our lame, wimpy produce in the supermarket upon my return. This week, I'm dreading my arrival at the supermarket. After wonderful trips to markets in Memphis and Nashville, where we brought home Carolina peaches, pecan oil, bright broccoli and more, I suspect our little local market just won't be the same. Still, I can enjoy another batch of peach cobbler, since the market's Facebook page is promising Indiana peaches already! What's new in your neighborhood? Post your link or comments below. School's almost out and I'm planning my summer reading. I used to love sitting out in the sun or floating around the pool with a good book. But these days, the best reading is during nap time snuggled up next to my sleeping toddler. Here's what I'm looking forward to reading this summer. Last Child in the Woods by Richard Louv - I've wanted to read this book for years! I grew up spending lots of time outside and I've often witnessed how today's kids are disconnected from nature. Playful Parenting by Lawrence J. Cohen - At 15 months old, Joshua is a blast to play with. I look forward to learning more about how to interact and have fun, and summer vacation is the perfect time for it! The Diaper-Free Baby by Christine Gross-Loh - I'm not sure if elimination communication is right for our family, but I'm interested in learning more. I look forward to lots of diaper-free time outside this summer! Smart Mama's Green Guide by Jennifer Taggart - I've talked to Jennifer through our Green Moms Yahoo Group a few times, and after a particularly interesting conversation about mattresses, I decided I simply must read her book. This Fine Piece of Water: An Environmental History of Long Island Sound by Tom Andersen - I've read this book a few times, but I've assigned it as summer reading for my Advanced Placement Environmental Science class so I'm going to review it. There are so many environmental themes, and it is perfect to introduce my students to place-based learning. Physics... I'm going to be teaching physics next year, and I need to study for the certification tests. So my summer won't be all play and no work! Oh, and by the way... the Moms Clean Air Force has a new badge! Add it to your blog to show that you care about clean air, children's health and our future. Please join the Moms Clean Air Force to help us fight for clean air for our kids. We need your voice! If you haven't already, please email the EPA to show your support of the new Mercury and Air Toxics rule. Thank you! I've always had a thing for antiques. They allow you to create a unique and beautiful home that is based entirely on reuse. Most people, though, hear antiques and think breakable, stuffy, and EXPENSIVE! 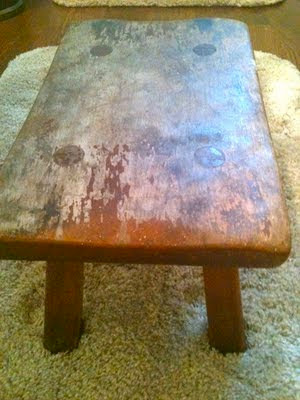 Sometimes, maybe but many times antiques are less expensive and/or much higher quality than new. This is particularly true if you shop antique fairs and estate sales instead of high end antique stores. But even in the latter place, you can still find some wonderful furniture - affordable when compared to modern retail outlets. - Dish Towels: Like a good greenie, I foresook (Yes, that is a word. I looked it up.) paper towels long ago. That means I'm a dish towel junkie. I use them for drying dishes and cleaning the counter, clearing spills, wiping dirty hands and dirty this and that and so on and so forth. And they get stained, ripped and raggedy and, at some point, move from the dish towel drawer to the rag cupboard - where they clean up other things. Nothing cheers you up, though, like a vintage dish towel with its saucy print. Most can be acquired for around $3 in the Bay Area. That means they are cheaper than cute towels bought at the store. I toss mine in with the rest of the laundry and feel virtuous as I reuse, reuse, reuse. - Stools: I have a six and eight year old who can almost but not quite reach this or that - as evidenced by the stitches my youngest got last night when he accidentally pulled a glass bowl off a high refrigerator shelf. I need stools. Stools, stools and more stools. For stepping, reaching and not over-reaching. To date, I've only got one in each bathroom but I'm on the look out for one in the kitchen as well now. There's something grounding and magical about a hand-hewn stool for my boys to stand on as they brush their teeth. There's wear where their little feet go, where someone else's feet went. I love the rough edges and I love telling my son that some father carved this stool and put it together for his son many many years ago. . . Beats saying that mom hucked it in her cart one day at Target. I've picked these up for anywhere from $10-$45 depending on where they are purchased. - Desk Chairs: I don't remember the last time that I bought a desk chair that wasn't vintage. You can usually buy one for $10-$45 depending on condition and where get it and, let's face it, nothing is more practical than a desk chair. Quality on old chairs rocks, by the way, and beats Ikea chairs all four legs down. And the best thing about buying antique? When you are done with it, you just re-sell it (except for the dirty dish rags of course!) - keeping the loop going and going. Do you ever buy vintage? If so, what are you favorite, most useful finds? The used kid shop is one of my daughter's favorite places to go. There's toys to fiddle with, clothes to flip through. But I wonder if she's noticed that we're just not hitting it the way we used to. Yes, customer service killed the customer. And then I did some thinking. I realized I was spending a lot of money driving back and forth to manage a sale that may or may not be taking place. And my two goals - getting rid of clothes and finding ones that fit my kids - weren't being met. And one day, I hit on a solution. Instead of trekking to sell my kids' clothes, I had other options. Like donating to an organization that gets clothes to those most in need. Even then, my work schedule and drop-off times don't always mesh well. More recently, I've also taken up the box-and-go method. As an experiment, I boxed up about 30 items of my son's size, set a going rate of $20, and posted it in my work's employeee classifieds. Here's a few highlights of what's in there, what size, no rips/stains, non-smoking home. Within a few days I had a potential buyer. There was no haggling. For $20 in the store, you can get two pair of PJs. The box of clothes was gone, I had some cash for the trouble, and mom was happy. It's funny to hear from your colleagues, "We just went through your clothes, and they're adorable!" What solutions do you have for managing your outgrown clothing? Do you resale, donate, share with others? Here are some things that can help you around the house but cost little to nothing. Just rub the inside of the banana peel over your leather shoes, leather furniture and silverware to get rid of scuffs. Wipe with a soft cloth when done. As always test on a small spot before using. You can also dust your household plants with the inside of a banana peel. Pour a 1/4 cup of baking soda down the drain, follow with 1/2 cup of vinegar, cover drain tightly until it stops fizzing. Flush with about a gallon of hot water. Spray vinegar on the item with the build up and rub with a cloth. You can add a little salt for tough spots. Spray vinegar in bowl. Let sit while you clean the rest of the bathroom. Add some baking soda and scrub. Heat one cup of vinegar in a microwave safe bowl for one- two minutes. Wipe out with a cloth and warm soapy water. Take a clean plastic gallon jug (an old laundry soap bottle works well) and add two cups of hydrogen peroxide and fill with water (preferably distilled water). To use just soak your items for 10 to 30 minutes or add a half cup to your washer. Keep drawers sliding smoothy by rubbing the runners with bees wax. Spray vinegar on the weeds/grass in cracks and other places you wish to kill them. Keep aloe in the fridge for burns in the kitchen. Another way to help heal burns fast is using mustard (make sure it contains turmeric). Aloe Vera plants are also very easy house plants that help clean the air and are great to have around for burns. What are your easy and free household tips? Do you use any of these? Over the past couple of weeks my Google Reader has been full of posts about the USDA’s new dietary guidelines, aka The Plate. I have been reading these with interest. I’m not sure why, because it’s all sort of irrelevant to me personally in a lot of ways. Mostly because I know that anything that comes from the government has a LOT of weird stuff going on in terms of lobbyists and Other Bizarre Machinations influencing what eventually is displayed for the humble American people. But…I’m interested anyway. So check out some of these links…Andy Bellati guesting at Appetite for Profit has a lot to say about the Plate, including the very pointed question of why “dairy” gets is own happy little spot on the diagram, since milk and cheese’s main dietary contributions are the high amount of protein they have (protein already has a spot on the plate) and the much-needed calcium they provide (which is also highly available, and far more absorbable, in many green veggies). The answer to that pointed question? Dairy lobbying. Michele at Appetite for Profit also has some stuff to get off her chest—asking why we can’t have MyPolicy rather than MyPlate. The other major objection many have with the MyPlate diagram is how incongruous it is with where the government subsidies go—check out this highly blink-worthy infographic showing clearly the disparity. And of course Marion Nestle, goddess of all things foodpolitical (or patron saint, anyway), has her own take on it as well as a lot of great links that I’m not going to repeat here. And last but not least, my personal favorite: Stephen Colbert mourns the loss of his favorite Egyptian mortuary-based nutritional diagram. So… what do you guys think of MyPlate? Is it just so much worthless government posturing? Or a step in the right direction? Welcome to the Phone Booth Flashback, where we take a trip down memory lane so you can catch up on posts from the Booth's past. Balance in a Family Crisis: Is It Possible? Going Green Mama copes with her husband's health problems while trying to stay green. Superhero Secrets: What Maria Von Trapp and Scarlet O'Hara have in common: Jenn the Greenmom links to some crafty blogs and projects. Meatless Monday - The Accidental Vegetarian: The Greenhabilitator checks out some meatless cookbooks. The Ants Go Marching: EnviRambo battles the ants for control of her kitchen. CSA: Community Supported...Artists? The Conscious Shopper checks out a way to support musicians similar to community supported agriculture. Keeping your sanity this summer: The Greenhabilitator lists ways to keep the kids entertained during the summer. A Day in the Life of Jenn the Greenmom. Maker Faire Report: Jess of Sweet Eventide reports on this cool event in the Bay Area. A Day at Maker Faire: A real life friend of Green Bean's shares more pictures of Maker Faire. Superhero Secrets: Some link love from Green Bean about sustainable agriculture. Healthy Child, Healthy World: A book review from EnviRambo. Greener Getaways: Green Bean on vacation. Cooking the Books: A round up of cookbook reviews from Green Bean. Ninety degree weather means I've been a market slacker this past week. Great intentions of checking out Wednesday markets or even my Thursday evening stops at the farm stand fell by the wayside as I raced to beat the heat and the resulting headaches. Today, though, I'm hoping to be off to check out a new market and can't wait to see what's out there. What's growing in your neighborhood? Post your comments below, or plug into our linky! Many moons ago, when we moved into our house, there was an ugly and boring grass strip between our house and the neighbor's. Gentle Green Phone Booth readers, you know what came next: the strip had to go. I mustered courage to cover it with newspaper and cardboard. Of course, I didn't have enough cover, and with permission, raided repurposed cardboard from said neighbor's recycling stash. Then, down went a layer of mulch. I had salvaged the already-present stepping stones, and replaced them on the mulch. Presto! Change-o! The next question was what to do with this new garden area. TruffulaBoy #1 was a toddler at the time. Inspiration struck: I'd make an Alphabet Garden. I scoured the web for wooden letters that suited my fancy, and painted them with bright colors. Aluminum pieces were procured, cut to a variety of lengths, pre-drilled with holes, and screwed on. I tried to find a plant to go with each letter. To enhance the challenge, the first part of the alphabet was situated in shade, and the rest was in full sun, which is not to say that I didn't just plant sunlovers in shade and vice versa and hope for the best. This year, we had a First Grader! And, in our Waldorf-inspired homeschooling, that meant that TruffulaBoy #2 worked his way through the alphabet, letter by letter. By now, he's got his letters down -- you should have heard him rattle through them at his recent eye exam! 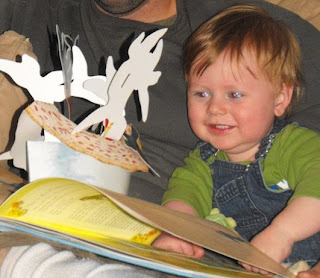 As he continues to gather his skills for that light-bulb moment of starting to read, we've been wrapping up the academic year with activities to support him in that. Out to the garden we went! We have a a few gaps -- I'd love your suggestions for filling these in, as well as native/edible alternates to what we've already got. When we needed garden ingredients for a recipe earlier this week, it was so much fun to be able to send the sous chef out to the "O" for a sprig of oregano, thus combining language arts, gardening, and cooking! What is the quickest way for a mom to toss her green principles to the side? Suggest something eco-friendly is bad for her child. Enter the crib mattress debate, where reusing a mattress is clearly eco-friendly but could be dangerous for infants. I shopped for a crib mattress 5 years ago, and still remember the anxiety of the process. And that was before I had read much about off-gassing or the chemicals used in flame retardants for mattresses. But I distinctly remember reading that used crib mattresses correlate to a higher incidence of sudden infant death syndrome (SIDS). And I've told the parents of second and third children ever since. However, I have also read about wrapping a used mattress — or even a new mattress — to prevent SIDS, and the idea stuck with me. The theory (which I do not believe has been proven or disproven) is that a child’s diaper leaks and mixes with chemicals in mattresses (including fire retardants). This leads to the growth of bacteria or fungi that results in toxic gases. Wrapping a mattress in impermeable plastic protects a sleeping infant from the gases. I recently asked my sister — who is expecting her third child! — if she is planning to buy a new crib mattress or use one of the two mattresses she already has. We’ve been researching to find the best answer. It is a shame to bring another mattress into the house, but if it is scientifically safer, of course any parent who can afford to do so is going to spend the money on a new mattress. Right? If one could safely wrap a mattress, that would prevent the use of more materials to construct a new mattress. On the other hand, wrapping uses plastic. Would it be better to buy an organic crib mattress? Apparently, waterproof organic mattresses are covered in the same plastic that can be purchased to cover an older mattress. And a non-waterproof new organic mattress would need to be covered by a separate cover anyway, right? Help us out. What are we missing? What crib mattress solution have you used for the health of your children? And while we’re on the subject, does anyone have suggestions for eco-friendly child-safe covers for twin mattresses during that difficult night-time potty-training period? On the first day of March, I went to my local garden center and bought six broccoli plants, six cauliflower plants, and six cabbage plants. According to the planting schedule I have, I was right on time, but even though I lovingly tended those plants through March, April, and right on up to the end of May, they stubbornly refused to produce any broccoli, cauliflower, or cabbage heads. Finally, I gave up; I needed that space for my tomatoes and peppers. But I'd spent $10 on those plants, and I'm not one to throw money on the compost pile! Luckily, I've learned through years of CSA subscription that quite often more parts of a plant are edible than the part we typically eat. In the case of broccoli, cauliflower, and cabbage, we typically eat the head, but the leaves are also edible. So even if you do get heads from your plants, don't let those leaves go to waste! With the broccoli and cauliflower leaves, I made cheesy bubble and squeak, a recipe that was traditionally meant to use up leftover mashed potatoes and boiled cabbage. My kids absolutely love it and always ask for seconds. Mix the potatoes with the cabbage or kale, egg, cheese, nutmeg, salt, and pepper. Divide and shape into 8 patties. Chill for one hour. Toss the patties in flour. Heat about 1/2 an inch of oil in a frying pan. Carefully slide the patties into the oil and fry on each side about 3 minutes until golden and crisp. Serve with ketchup or salsa. Wash the collard greens in a big sink of water. Cut the leaves from the stems, chop the leaves, and place in a large pot. Fill the pot with water. Add the rest of the ingredients. Bring the water to a boil and then simmer for about an hour, stirring occasionally. When done, the greens should be tender and dark green. Have you creatively used up any garden failures? Awhile back I talked about how Hershey uses slave labor. So now what do you do for chocolate syrup? Fear not, here is a yummy homemade version that not only tastes better, it uses better ingredients as well. Stir all of the ingredients together in a sauce pan. Boil 3-5 minutes, stirring constantly, until sauce begins to thicken. Use in place of chocolate syrup in recipes. I love to use this in shakes, chocolate milk, and my homemade fraps. It's very simple and affordable. What will you use it in? Redistribution--not such a bad thing this weekend! We had an awesome weekend. Every year in early June our entire subdivision has a “multi-family garage sale”—anyone in the whole area with stuff to sell all does it on the same day, there are ads in the local papers and maps of all the houses involved and what they are selling, and it’s just a grand and wonderful day for all. I’d say maybe 20-30 houses in our little area were part of it. It was a great neighborhood morning, and a great family morning. After reading different musings about children and learning money skills and allowance vs. payment for jobs, we took this as an opportunity to do a little teaching about money. Each child got to take $5 in quarters from their piggy banks and told that they could buy what they wanted, but that that was all the money they had; they could decide what they wanted to buy, it was their choice, and we wouldn’t make the decisions for them. It was a really fun and interesting process. It took them a while to realize we were serious and to stop asking, “Mom, can we get this?” about whatever it was…the answer was always, “It’s your money, you can get whatever you’d like, just decide for yourself whether it’s worth that amount of money to you.” They each wound up with a few stuffed animals that they really liked, and my daughter got a pair of purple flip flops. (I didn’t make her pay for the ballet slippers; that’s mommy’s department.) It was really cool seeing them start to really think about what their money was worth, and how much they wanted whatever it was, whether they could afford it, and more important whether they chose to. Each of them came home with money still in their pockets, and they seemed supremely pleased with their choices. It was wonderful seeing this low-cost exchange of goods, as people cleaned out their basements, sat outside and visited and chatted and had fun and found that something someone else was desperate to get rid of was exactly what another person was looking for. Lots of stuff kept out of the landfill, at least for now. Maybe a little less new stuff manufactured. New families finding baby goods; the people selling the baby goods finding some great toddler gear at another house. And so on, up and down the line. I wonder, if every neighborhood did something like this, even not as complicated as a Freecycle (which itself isn’t that complicated! )—how many resources would we save? And how much would we gain, learning more about the people who live near us, becoming more and more of a community, keeping an eye out for each other? How about you, Booth readers—do your communities do anything like this? Balancing grocery bills and budgets: Going Green Mama shares some ideas for staying on budget while supporting your food values. Meatless Monday: Weekday Vegetarian: The Conscious Shopper shares a video presenting the idea of "weekday vegetarian," vegetarian Monday through Friday and meat-eater on the weekends. Grocery Bills, Budgets, and Flawed Foods Systems: The Conscious Shopper suggests that rather than being judgmental about people's food choices, we should work to change the system. Book Review: Wisdom of the Last Farmer: A book review from the Greenhabilitator. Stop and smell the...strawberries: Truffula and boys perform a cook-off between a regular batch of jam with sugar and a no-sugar batch. 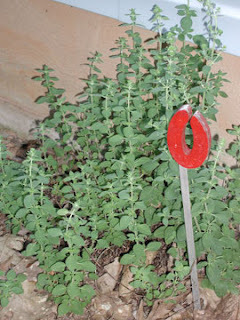 Edible Exhibitionism: A funny post from Green Bean about front yard gardens. The End of the School Year: EcoWonder prepares for summer. Declutter Cobbler: Green Bean saves some fruit from the compost bin by making a cobbler. Ring...Ring...: The Raven says goodbye to the Green Phone Booth. Farm-in-a-jar: Sprouting with Green Bean. Superhero Secrets: Link love from EnviRambo. Ship Shape: EnviRambo sends a letter to a company expressing her concern about their over-packaging. Welcome to our first Farmers Market Report at the Booth! I just came back from a jaunt to one of our local markets with the kids. I scored deals on some heirloom tomato plants ($1 each, can you believe it?) and grabbed some peppers and herbs to help round out some empty spots in our garden. Here's hoping they survive our 90-degree temps. I was also excited to find a table with garlic scapes. I'd been toying the last few days with harvesting my own or letting them continue to grow, so this helped me realize that maybe it's not too early for me to make a stinky dish or two! (For those newbies to garlic scapes, you use them just like garlic.) Sadly, it's one of the few things I've been able to harvest so far this year, as we've had an unusually cool and wet spring, delaying just about everything. How are things in your neighborhood? I've been a working mom since September, and I'm still trying to figure out how to balance mothering, working, being a wife, taking care of my home (ha! cleaning is GONE) and continuing to move toward sustainability. It's hard to find time for myself, let alone time to go "above and beyond" mere survival. I'm weeks away from summer vacation and I'm finding that I just can't wait to have some time to do what I want to do! In the past few weeks, I've had to skip some events that I would have jumped to participate in if my schedule allowed: a webinar and chat, both for the Moms Clean Air Force, and a nurse-in at a local mall. I've been blogging for the Moms Clean Air Force since March and hated to miss out on those two events. I'm always looking to discuss environmental topics and learn more about reducing my own environmental impact or gaining content knowledge to aid in my lesson planning. When it came to the nurse-in, I would have liked to go since I would consider myself to be a breastfeeding advocate and I've never done anything like this offline. I don't even know any other moms who are currently breastfeeding in real life, so it would have been nice to at least meet some. It occurred to me that in the rush to do what I have to do, I'm cutting out activism. I'm skipping events that I feel strongly about and I'm not "practicing what I preach" online. It's much easier to write about taking action when it's midnight and everyone in my house is finally asleep (except me!) than to actually take that action during daylight hours. I'm not saying that working moms have it harder than stay-at-home moms. I was fortunate enough to stay home for six months with my son and will be a stay at home mom for the summer in a matter of weeks. I know that things are also very difficult to get done when you spend your day taking care of your children, with the added stress of surviving on one income. Either way, at work or at home, it's not easy to find extra time. But when we really care about something, the way I care about protecting the environment and children's health, I guess we have to make time for activism. I'm still learning to find balance and to give myself a break when I simply can't make it all work. I'm currently trying to finish up my school year, winding down teaching new content and beginning to review, writing my final exams, all while also gearing up for taking on the new challenge of teaching physics next year. I've decided that I need to cut myself some slack and stop feeling guilty when I need to say no to something, even if it's something I really care about. Even if it's only for the next three weeks, I'm going to be proud of what I can accomplish and stop worrying about the rest. How do you find balance between your family responsibilities, work schedule and activism? Do you have any time for hobbies or to sleep? From the nature-loving bean of Green Bean. I've been in a hurry this year. We moved into a new yard, ahem, house, (but you can tell what was important to me!) late last summer. In March, I was finally ready to address the yard in earnest. That meant putting in paths to avoid slopping around in the mud, adding raised beds, edging out garden beds and trying to convince my gardener to install irrigation without crushing all of my coddled plants. I knew from experience that that most important thing to building a back yard food forest is to first attract the bugs. Then the birds. Then you build an ecosystem with them at your base. The bugs and birds help keep pests off of your precious peas and other vegetables. The most important step in attracting insects - beyond avoiding pesticides - is to sheet mulch it. I slapped down some sheet mulch under the plum tree but I really really needed to get at least one season's worth of gardening in before resorting to the piles of leaves, compost and cardboard for the rest of the yard. In any event, I put up some birdhouses, a birdfeeder and a birdbath and hoped for the best. My hopes were rewarded when, one day, I noticed a bit of grey fuzz along the hole of one of the birdhouses. I watched and waited until I finally saw two small birds appear and one pop inside. In the meantime, we had some unexpected but very needed work done on our house. As loud as it was, I assumed that it wouldn't affect the birds. Their birdhouse was at the very back of our long lot, shaded under a tree with my neighbor's gurgling fountain hopefully drowning out the noise. Two weeks went by and I never saw my little bird family. I peeked inside the birdhouse to discover a nest full of eggs. Another week of waiting and watching and I've given up or they have. Perhaps it was the noise. Maybe one of them was injured or worse. Or maybe . . . The nest sits up at the top of the hill in a now quiet birdhouse with too quiet eggs, destined to never hatch. Down the fence from it is a blue birdhouse also filled with an empty nest from two years ago (yes I know I should clean it out). Those birds abandoned their nest when a windy day knocked their birdhouse out of the tree. What luck have you had attracting wildlife in suburbia? Have you watched eggs hatch and baby birds grow up and leave the nest? What is your favorite method for providing shelter? Or have you had a similar sad result as my empty nest? The temperature here in Raleigh was 98 degrees today. With the humidity factor, that makes it sit-in-front-of-the-fan-all-day weather, but instead I joined my elementary age boys to watch their staff vs. fifth-graders kickball game. You're lucky I'm able to write this post tonight - we just about melted away. Sometimes I think about how Southerners survived our long humid summers before the invention of air conditioning. In my head, the South of the past looks like Gone with the Wind with ladies in poofy hoop skirts and men in long jackets, but surely that's not how they dressed all the time, because oh my goodness, they would die. No wonder women in books were always fainting. I have a theory that women of the past actually spent all day in their underpants and only threw on clothes when someone came by to visit. If I didn't have air conditioning, that's totally how I'd spend my days. But anyway, since it's so hot and since Retro Housewife shared a recipe for homemade popsicles the other day, I thought I'd tell you about my popsicle mold. It's the stainless steel ONYX Popsicle Mold from Tickle Trunk. I bought it at the beginning of last summer, and we've made at least 600 popsicles since then. Besides the juice-cicles that Lisa suggested, I also fill ours with smoothies, yogurt, pudding, ice cream, tea, and sometimes even the fruity sugar water in home-canned peaches. I chose this particular pop mold because it's made with high-quality stainless steel that will hopefully last us a really long time since I'm trying to update my kitchen with products that last. However, at $40, it does cost a pretty penny. Until I started writing this post, I had forgotten how much it cost, and honestly my first thought was, "Really? The Conscious Shopper paid that much for a popsicle mold?!" I must have been in a splurging mood that day. There are a lot of pieces. Every day when I hand out the popsicles, I start chanting, "Do not accidentally put your lid in the trash!!!" The shape of these molds is very phallic. That's not really a negative, it just makes me giggle. Yes, I'm really 12 years old. If you're not willing to spend $40 on a popsicle mold, you can easily find BPA-free plastic molds online, or check your local thrift store. Disclosure: I bought this product with my own money and have not received any compensation for anything I wrote here. I just love popsicles.